(Text automatically translated) It 'a very comfortable apartment that is part of a typical art nouveau villa inhabited by the owner, consists of a small living room open onto a large private garden furnished with table and chairs for outdoor and two chairs for relaxing moments. 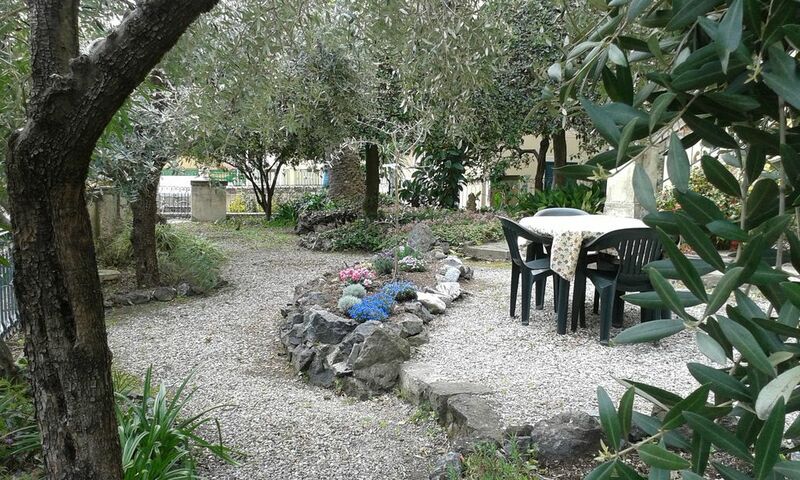 Here you can safely eat or read in the shade of olive trees, oleanders and pittosporum. There is a kitchenette with washing machine and everything you need to cucinare.La spacious master bedroom is also open to the garden, this leads to the bathroom with doccia.Vi is also a bedroom with two single beds ideal for children or at least for members of the same family. Close to the center, the beach and grocery stores with local products that deliver even domicilio.I owners will be delighted to welcome you and to advise you to make your vacation more enjoyable. "The property is very clean. There is some road noise in the early mornings but nothing too distracting. There is use of a lovely garden with welcome shade. There are a couple of points worth noting firstly, one bedroom has ensuite toilet and shower facilities making it necessary for the occupants of the other bedroom to pass through the main bedroom in order to access the toilet/shower facilities. Also the kitchenette is a little small for tall/large guests. Overall the position of the the property is ideal and the owner, Ivana, is the perfect host- warm, friendly and very helpful." The apartment(and bathroom) are very small but effective. But because the weather is nice you're just sit outside. Location is near the beach, town center and train station. The apartment is also located in front of apartment buildings of locals on a busy road, where up to night traffic roars along. A bottle of water in the fridge on arrival we would have appreciated it. For example we were gone from home 10 am and 7.30 pm were in the apartment in Levanto. "We stayed in the apartment during the week of 30th June, to 7th July, although due to flight arrangements we could only stay until the 6th, which the host was happy with. The apartment is typical Italian, with tiled floors and very clean decor. Our apartment had a garden attached which although was next to the road was very well maintained and nice to relax in after a hard day on the beach. Our host Ivana was more than happy help with any problems that we had, and explained everything about the apartment from how everything works to the recycling procedures. The apartment is a very short walk to the nearest shop, so getting provisions is not a problem and the shop is well stocked with local produce. Overall The apartment and its setting are very good, we will hopefully be visiting again next year." "Spacious enough, comfortable and clean apartment 5 minutes by foot from the sea and the town center and 15 minutes from the railway station. Faces a private garden with olive and citrus trees and oleanders. Absolutely worth the cost!" Ännu några sköna veckor i Levanto med fina bad och ljumma kvällar. Boendet centralt med närhet till allt. Gatans puls har gett liv åt vistelsen och det lilla köket gav både värme och kulinarisk inlevelse. Uteplatsen gav skugga och sol som önskades. Longement agréable, conforme à la descriiption. Bon accueil de la propriétaire. Logement propre, aménagé avec goût, avec le "fonds" nécessaire pour le séjour(sel, huile, vinaigre, éponge et liquide vaisselle...). Literie confortable, 2 vraies chambres (celle de parents mène à la salle de bain commune...). Salle à manger petite mais acceptable pour 4. Jardin pour manger longe la location. L'ensemble se trouve en hauteur (cf. la photo du site homelidays), au bord de la route, heureusement pas trop passagère. Ivana a été serviable et disponible quand on en a eu besoin. En somme, il faut seulement souhaiter du beau temps pour profiter de la plage (à quelques centaines de mètres) ou des Cinque Terre (la gare à 10 minutes à pied, Monterosso est à 5 min de train). Le centre de Levanto est à 5 minutes à pied pour faire des courses (pain, supermarché, souvenirs, glaces...). (Text automatically translated) Genoa-Livorno, exit Carrodano-Levanto. After the train station along tree-lined street (Corso Roma), the last intersection, turn right (direction Bonassola) by Trento Trieste.